What's the dish for the day? Obviously, its a noodle dish. Yes. Noodles again (Fried Kuey Teow, Fried Mee. Laksam Noodles & Hokkien Mee). No, no, not the same kinda (Lamb Pho/Vietnamese Noodle Soup). Not the same. Trust me (Mee Rebus Vegetarian &. Chinese Vegetarian Noodle Soup). This is the simplicity, elevated by store-bought sauces which have been sitting in my fridge and I, as you know, am someone who fancy using up whatever vegetables in the fridge as well (Tom Yum Prawn Fried Rice)? Rather a convenient matter actually if you considering such Spicy Thai Noodles. Basically, lemme tell you that anything goes. Meaning, ingredients that can jive, click and dance together for the customary Thai spiciness and sourness (Seafood Tom Yum Soup, Tom Yam Chicken, Tom Yam Fried Mee Hoon & Thai Green Fish Curry). As per your taste, let me remind you again, and also as per the ingredients you have at home. 2 rolls of yee mee noodles or any other type of noodles - blanch to soften. When oil is heated, fry garlic, prawns and squid. Once prawns and squids are cooked. add all the sauces, salt, sugar and pour in water. Place noodles on a serving plate with cabbage and fried egg. Pour sauce over and garnish with spring onion and pickled green chillies. Glad to see that the comment issue is resolved. 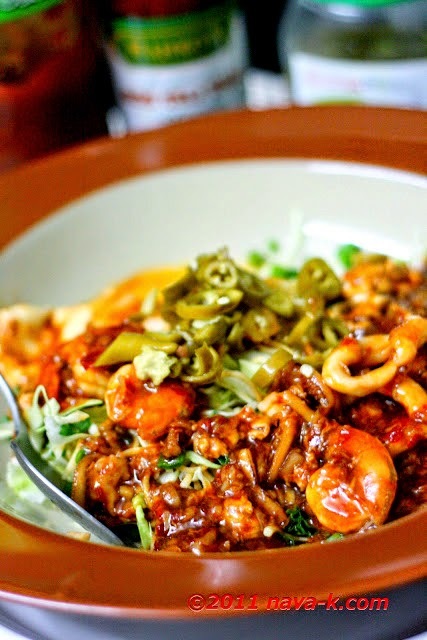 Your noodle dish does look delicious-great for lunch or dinner. Also, I think I would like to have one hour in your pantry-I am sure you do have an amazing array of sauces in there! Happy Monday. it looks very spicy n it looks very delicious.. I am drooling. I love noodles and this dish looks fantastic!!! Another delicious creation, Nava! Love all the photos...they show how mouthwatering your noodles in Thai sauce is! Thanks everyone for all the generous comments and appreciate each one of it. All those green chilies make my mouth water - this must be very flavorful. 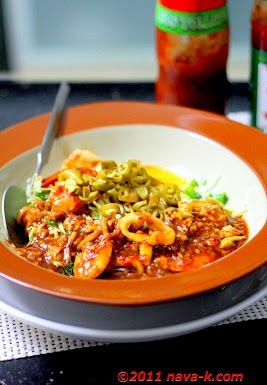 Looks yummy, I like sour and spicy dish. trekking your yummy blog!!! i tasted thai foods. kinda spicy and whooaaahh! delicious! burp! Pickled green chillies and noodles, always go hand in hand! I love this dish, amazing how so many fantastic dishes are "just" put together! I'll have to bookmark this next time I want a quick and yummy dish that hits the spot! Hey gal, how r u? Sorry, haven't been really active recently. Getting very lazy. Hahaha! It's really nice to be greeted by another of your recipe :) Keep up the good work, dear! Oh, Nava....this looks delicious and your photos are simply stunning! I'm not a seafood fan but this dish looks amazing. Maybe I could substitute chicken. The pictures are excellent by the way. Yes, I like cabbage in my noodles but not other green leaves. this looks yummy with four different sauces and even pickled green chillies. Oh, I love Thai sauces! I could easily eat these noodles for lunch or dinner (or even breakfast!!!). YUM. This sounds great, all those chillies would warm you right up! This is heavenly...always enjoy thai chili sauce although I have to get ready with a box of tissues, but the satisfaction is always there. I could eat this at any point in the day! Looks delish!